As President, I’m entrusted to continue a conversation between Dancesport Australia and you, our loyal members that has endured for many years. In conversations with our members, I am struck with the level of passion for our beautiful sport and the desire to see it flourish. Yet to flourish we have to change as we cannot do it alone. Our “partnership” requires us to have transparent communication, to work through challenges until we break through to new levels of achievement and understanding. A great dance partner focuses on selfless contribution to the common good, that is at the core of our commitment to you. The reason we have your interests at heart is that they are our values too. Our kids danced in the same events, we attend the same studios, we obsess over the same contentious issues you do and work together to find the right solutions. We love going to competitions to see the growth of the recreational field to be inspired by our hard-working competitors and to be awestruck by our elite dancers. You can trust that we love our beautiful sport as much as you do. The metaphor “standing on the shoulders of giants” never mentions the difficult climb to get there. Our past style of thinking will not suffice for us to prosper in the future. We need to be adaptable, envisage what’s around the corner, with methodical steps forward - along with the sheer grit of determination to see it through. Developing a national sporting organization is not easy, sometimes it is bedlam and the wheels fall off our plans. Other times we are moving forward methodically, bringing our industry to the forefront on the World Dance scene. When you see the significant initiatives that have taken place since this team of National and State organisers have worked together - you will see progress - as the seeds we have planted grow - and further develop the future of a great industry. For us to grow, the focus for Dancesport has shifted from governance only - to the important need to become an industry leader - that develops partnerships with dancers, studios, professionals, dance societies and all stakeholders. For us to grow we are now working closely with studios, developing strategies to bring new clients to their businesses and increase the number of dancers on the floor in social dances, studios, and competitions. For us to grow, we need to protect and support our members through governance and contemporary policies aligned with national sporting benchmarks. We need to support our dancers and find ways to help them achieve their dreams. For us to grow, we have to look from the perspective of newcomers to our industry. What do they see when they first arrive at a dance studio or competition….? Put yourselves in their shoes. Find out what is their true motivation to potentially start a life long journey in dance. Is it competitiveness, family expectation, the need to belong, athleticism? What will keep them motivated, when the competition gets tough or seems unfair - for them to trust that there is integrity - within our judging system. At our strategic planning summit this April, our focus will be on future developments. 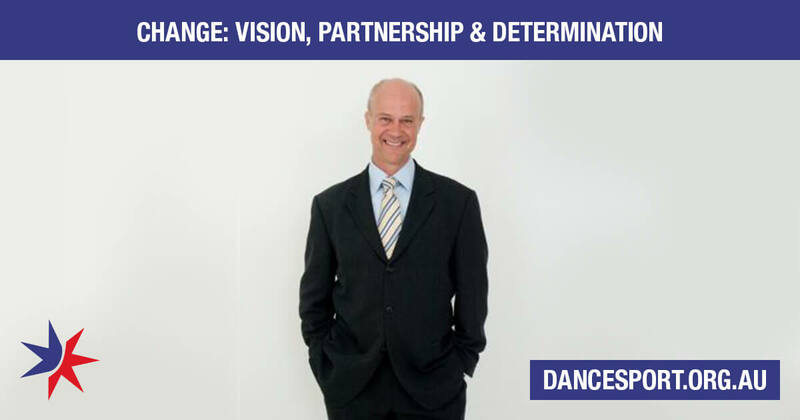 We want to clarify and implement the most effective drivers in our industry, to focus our effort on the Vision of Dancesport Australia. As you look for ways to achieve your goals in Dancesport, we as your partners are excited to be on the path with you, constantly seeking new solutions for all of us.